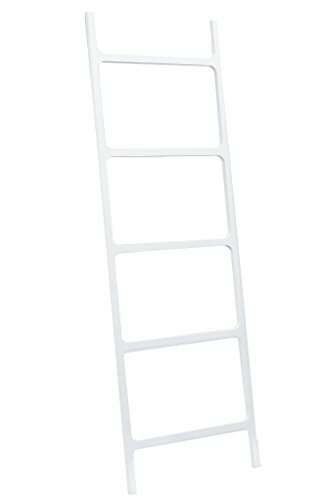 DWBA Stone Standing Towel Rack Ladder for Bathroom Spa Towel Hanger, White. Dimension: 23.6 W x 0.8 D x 70.9 H in. - Material: Solid Surface - Color: White - Type: Floor Mounted - Shape: Rectangular - Designed in Germany STONE is a high quality composite, solid surface material, made of natural materials, resins and polymers. This composition gives the STONE a unique warm quality, similar to natural stone. Resistance to all sorts of chemical and physical influences, as well as its completely impermeable surface make this material the one of the first choices for interiors when hygiene and neat design matter the most. Waterproof: corrosion or swelling due to steam or moisture is not possible, the surface cannot be damaged by moisture, rot or mildew - as liquids cannot penetrate it. 100% durable due to impact and shock resistance. 100% hygienic, dirt repellent and stain resistant due to non-porous surface. Chemical resistant, and completely homogeneous. Pleasant to touch. Easy to repair and care. Flame and heat resistant. Eco-friendly, 100% recyclable. STONE is 100% European made quality. Dimensions: 23.6 W x 0.8 D x70.9 H in. If you have any questions about this product by DWBA Bath Collection, contact us by completing and submitting the form below. If you are looking for a specif part number, please include it with your message.